For Eamon Colman, each painting is a new conversation between the processes of painting and a complex, remembered, and inclusive sense of a place. My encounter with his work has also been a conversation, unpredictable, surprising and often humbling. I have not written about art as art for many years and my interest lies in its “broader implications… as an epistemology … a way to understand one’s relationship to what lies beyond it.” In its being a place one enters alone, “but in communion with your imagination… solitudes in which we meet”. I initially assumed my task here was to pay close attention to the conversation that unfolded with the work and then to write a text. There was, however, a complication. After a life working in academia, discovering Colman’s work upped the challenge to think and write differently. A challenge that, in the last eighteen months, has become closely related to my return to painting. So, I write here as a late returnee, one wishing to look again at the complex relationship between painting and place. I knew virtually nothing of Eamon Colman’s work until I saw paintings from his Scattered Showers exhibition. Initially intrigued as much by his knowledge of the history and qualities of the County Kilkenny uplands as by his work, I nevertheless began to look carefully at the paintings. My curiosity stemmed from our being creatively immersed in similar landscapes, engrossed by the particularities, challenges and environment of upland regions, their weather, their specific inflections of human community. Recently, visiting Colman’s studio, I carried some of his earlier paintings in my mind’s eye. These provided a bridge between his way of showing how the spaces of the world feel and my own internal store of valued paintings. 'Dreaming in exile of a lonely field' pushes identification as landscape to its limit. With time, however, its freely worked interlocked spaces - their densities and transparences, horizontal brush-strokes, textures and clusters of marks – form distinct yet conjoined fields resonant of land first walked, then re-membered through the act of painting. (The speckling of small cross-like marks, I now know, recall an encounter with a departing murmuration of starlings). Working my way out from a specific painter’s strategy, the play between spaces paired and contrasted, that is masterfully deployed in both Sassetta’s The Wolf of Gubbio and Peter de Hooch’s Courtyard of a House in Delft, I discovered a clear formal kinship with Colman’s painting. That kinship provided an initial portal into his work. The process of painting land, first walked and then remembered, created 'Dreaming in exile of a lonely field', but it remained incomplete until given its title. The title reverberated, at least for me, with Liam Carson’s 'Call Mother a Lonely Field', an emotional archaeology of family, home and language, and of Jackie Levan’s haunting song of the same name. These resonances amplified my response to the work, suggesting a common emotional heft in relation to land, and reminding me that Colman has a wide knowledge and deep appreciation of poetry. (This exhibition shares a title with Paula Meehan’s poem The Thaw, in the collection Geomantic).Also, that he draws on collective, as much as personal, memory in the work. What remains in the foreground, however, is a painting wrought from coloured matter, from the pull and push of painted spaces that conjoin, in paint as in memory, a sense of the shifting sense of materiality experienced when walking a place. I was puzzled that Colman is simply referred to as a landscape painter. Then I learned that he’d described himself as “fundamentally … a storyteller”, as influenced by “listening to other people’s stories and interpreting their dreams”. This provided another bridge into the work, linking his approach to that of deep mapping. It confirmed the importance of place as narrative, as “a simultaneity of ‘stories-so-far”, articulated in images made by interweaving different processes, seen as stories, moving through time. Discussing the walks that prompted many recent paintings, I came to see that one work may reference both a distant historical act that violently reshaped a landscape – say a hill built to enable artillery to better attack a castle - and subsequent slow modifications, over centuries, to that same hill. Various paintings in the exhibition suggest such a convergence of distinct temporalities, both those related to Oliver’s Hill (the reference is to Cromwell), but also to the Bog of Diamonds, so called because of a local inability to pronounce its long-dead Dutch owner’s name (and despite at least one terrible episode in its history). 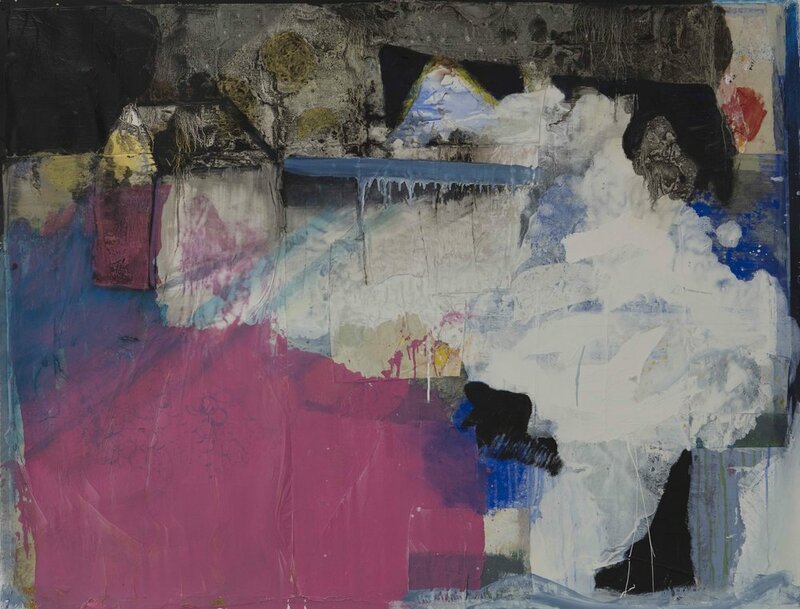 I began to see how Colman’s embodied thinking, working with colour, gesture and, increasingly, varieties of texture and surface, relates to the dynamic of place conceived as storied material, as a play of unfolding matterings over time. Paint can move us, stir our senses and memory through colour and tone, carry traces of life’s rhythms through the dance, precise or wild, of a brush. Its texture, viscosity, ability to hold bodily gesture in the weight and direction of a mark will, if we open to it, animate felt meaning. Unsurprisingly, in a critical culture that over-privileges concept and fears ‘the thought of the heart’, the vast literature on painting has almost nothing to say about paint’s material discourse. One rare exception, written by the painter-turned-art-historian James Elkins, uses alchemy as “an encounter with the substances in the world around us”, to suggest “how paint can mean”.However, his approach seems too rarefied to speak to the weathered earthiness of Colman’s recent work. By contrast, Jane Bennett’s Vibrant Matter, more worldly and inclusive, encourages us to engage expansively “with vibrant matter and lively things”, to dissipate binaries such as “life/matter…and organic/inorganic”, arguing for: “an aesthetic-affective openness to material vitality.” This seems to me comes closer to Colman’s concerns. It also invites me to read his paintings as animating a spectrum of matter(s)-that-matter. An enacting of ways of ‘being in’, rather than ‘looking at’, a landscape, encouraging me to sidestep the strict conceptual distinctions between time and space, nature and culture. There is a cliché that the secret to landscape painting is ‘knowing where to sit down’. Colman doesn’t sit still, nor pin down the appearance of a place from a single, static viewpoint. Instead he walks, attending with every sense, moving within the multiverse of contingent and changing worlds, internal and external, that surround and embrace him. In all this there is a challenge to the assumption that matter is inert, dead. The pernicious assumption that feeds our culture’s hubris, its toxic fantasies of conquest and consumption. Fuels our violent disregard for the intricate and lively reciprocities proper to the life of a regional watershed in relation to a river, a river to an old wood, an old wood to a tump of sphagnum moss. Colman’s paintings remind me that the places of the world, distinct yet endlessly implicated in rich meshes of connectivity, are animate. They exist not just in the immediate here and now, but extend a complex past towards a potential, living, future. Or, as Colman has put it: “the earth is a living being like you or I … it’s an organism that breaths and communicates”. Increasing dramatic climatic swings between heat and cold are becoming normal. The recent winter and spring in upland regions across both Ireland and the UK was extreme, with deep snow in many places and the thaw, when it arrived, was often slow, messy, and late. Many of the paintings Eamon Colman has made recently hint at personal, social and environmental change. The sense of strong, high key colour still foremost in his 2015 exhibition, Walking at three miles an hour has become more muted, and in many works now seems subordinate to a concern with surface. Over that period, the highlands of County Kilkenny, where he lives, works and walks, have seen worsening weather, something he has verified for himself by logging the decrease in sunny days. Climate change is inscribing itself onto the already battered and weather-worn uplands across the western islands of Europe, rendering them more ragged, drearier, wetter for longer periods each year. The human hold on such regions, which for long historical periods has been somewhat clumsy and tenuous, may once again be slowly slipping away. They are now all-too-often raw, grey or white with mist, soggy from days or weeks of incessant rain, torn into both by violent storms and the whole spectrum of agricultural and other human intervention. Something of this is echoed in those recent paintings where surfaces, by turns raw, fragile, slippery, textured by the traces of stain and run-off, aggravated by re-working, come increasingly to the fore. The airy qualities of The white edge of silent light, The astonishing art of the cold snap, or After dawn rain the wind came to lift everything, their sense of wide skies and movement, are largely gone. The more recent work seems bleaker, earthier, increasingly marked out by passages of black, blue-black, grays, whites and off-whites and, above all, by their infinitely variegated surfaces. Surfaces roughly laid down, cobbled together, then tattered, scoured, pressed into or worn flat, by the process of their own making. Surfaces distinguished, in turn, by being weathered, washed, compressed, lifted, worn smooth, stained, torn, runnelled and eroded by intense, almost heedless, acts of making, unmaking, remaking. They suggest harsh, rapid, changes; a life world patched up, dug down into, stripped back, exposed. They have both an air of foreboding and of the ancient peasant ability to ‘make do’, ‘get by’. Not, however, in response to official exhortations to greater resilience, but simply because there is no alternative. A feeling too of grim anticipation. During one conversation, Colman told me he senses a growing challenge from the natural world; its telling us to: “either piss or get off the pot”. At this point I have no option but to join the company of outliers, those who turn to subjugated, superseded, suppressed, marginal or ignored knowledges. No option because the underlying presuppositions of Western thought are too narrow to allow me to draw out the most significant resonances of The Poet’s House. I need a more inclusive, nuanced orientation to bypass the assumptions of a world predicated on the ‘either/or’ inherent in our monotheistic tradition and its continuation by other, secular, means. Taoist philosophy is helpful here in distinguishing between ethereal (Hun) and corporeal (Po) souls. (In this context After dawn rain the wind came to lift everything enacts something of the qualities of the Hun-soul). Broadly speaking, the Po-soul is understood as linked to sensory perceptions, to a tangible, embodied consciousness inseparable from sight, sound, smell, taste and touch. To that aspect of human consciousness that, in obedience to over-arching ecological imperatives, dissolves back into the earth with the body at the time of death. But also, by implication, the soul that, perhaps paradoxically, underwrites embodiment and, consequently, makes the creative arts possible. The soul that also represents our primal or animal instincts and our ability to receive what is of essential worth, enabling us to let go of what no longer nourishes us. A sense of soul, then, appropriate to a re-articulation of the ecological dilemmas we face. I experience The Poet’s House as a nuanced, layered and highly particular meditation on the Po-soul. At a personal level I sense this painting’s relationship to Colman’s recent painful illness and slow recovery (the occasion that prompted many of the small works here). Such illnesses strip us back, both deepen our sense of mortality and of the ‘worlding’ of the world we inhabit. They leave us both thinner-skinned regarding the unexpected beauty of everyday phenomena and more ‘dug into’ the necessary in our lives. At a social level, I see the painting as reflecting on the value, and inevitable fragility, of friendship in the face of death. Finally, at the ecological level, I sense it speaking to our need to more openly acknowledge the endless dissolutions and transformations facing all matter, ourselves included. Transformations without any redemption for human beings, beyond our facing what simply is, in all its richness and complexity, both on our own behalf and that of all non-human beings, our kith and kin. The Poet’s House is perhaps unique in Colman’s work in including a clearly articulated figure. A small bent figure, almost black, placed centre stage in the lower part of the painting. While ghosts and traces of figures have previously appeared in a very few other paintings, including Meabh’s tree on the hill of pain, none are as emphatically present as this. (Colman renounced the figure, along with its overwhelming primacy in western art, at the start of his career. When questioned about the rare exceptions, he simply observed that, in Ireland, “our ghosts are very near”). Paradoxically, while emphatically present, the figure also appears as if being erased by the very earth it cultivates. She appears - the painting was occasioned by the death of the poet Leland Bardwell, aged ninety-four - as her own Po-soul, cultivating the earth even as she returns to it. Leland Bardwell’s The Noise of Masonry Settling contains her Four Woodbines, with its opening line that marks “the torn and dirty sheets” of “winter years” and, in doing so, seems to speak directly to the genesis of many of the works in this exhibition. The Poet’s House is, I would suggest, one key to the heft of the whole sequence of Thaw paintings, large and small. We can never say, definitively, what such a painting ‘means’ or ‘is about’. Such works are an invitation, not a statement of fact or intent. What, then, am I to write of the small stained house grounded in, and fading back into, a roughly assembled, dissolving black landscape? (And do these blacks reference those enumerated in Bardwell’s Black in Achill?) Or of the slab of pink resonant of a child’s painting of skin, a pink that here fades into a blue-black that hints of old blood in a vein under the papery skin of old age? Or of that slab’s relationship to the small black figure herself, dissolving back into a pool of blue, of memory? What sense is evoked by the upheaval, be it of thaw or glacial dissolution, projected by the various weights and thicknesses of the slippery white paint strokes that dominates the centre and the right side of the painting before, as I see it, tumbling down into the sea below? Whatever responses these and other questions may prompt, they will be inflected by our openness to the metaphorical resonances, within the painting, of its title. Colman spoke movingly to me of Leland Bardwell’s last days in her cottage on the coast of County Sligo. Also of her poem, A Single Rose, which appeared with several of her obituaries, a poem in which her brain has transmuted into “a single rose”. (This is the source, I suggest, of the red, rose-like form that emerges, far top right, from behind the swath of black that threatens to hide it). But the painting, for all its questions and sense of polarized and elemental forces, and of the dissolving of the poet as Po-soul, will ultimately remain a vivid confluence of senses that always escape the precision of meaning we ask of prose. "… is always going on in display. It requires no literal witness, no special prophetic gift, only exegetical intelligence, that ability to read display, to notice beauty. No testimony, only a careful noticing, a considerate appreciation of “eachness” (Wm. James), each thing in its image, each word in its echo." James Elkins (2000) What Painting Is: How to Think about Oil Painting, using the Language of Alchemy New York: Routledge p. 4. Suzanne Hudson ‘Personal Voyages’ in Lynne Cooke (ed.) (2018) Outliers and American Vanguard Art Chicago, University of Chicago Press p. 118. Rebecca Solnit (2014) The Faraway Nearby London: Granta p. 54. Paula Meehan (2016) Geomantic Dublin: The Dedalus Press p. 75. (Eamon Colman could not know the resonances this poem would have for me, given my long-standing preoccupation with wolves, but such are the strange coincidences, if indeed that’s what they are, that haunt the places to which poetry takes us). See Nigel Rolfe (2006) ‘A Conversation with the Artist’ in Profile 25: Eamon Coleman Oysterhaven, Co Cork: Gandon Editions pp. 13 and 17. Doreen Massey (2005) For Space London: SAGE Publications p. 9. James Elkins op. cit. pp. 6-7. Jane Bennett (2010) Vibrant Matter: a political ecology of things Durham & London: Duke University Press pp. viii and x.
 Eamon Colman in conversation with Brian McAvera (2007) ‘Between Landscape and Abstraction’ in Irish Arts Review Spring 2007 p. 67. http://www.eamoncolman.com/wp-content/uploads/2016/05/Irish-Arts-Review_Feature-copy.pdf (downloaded 03.03.2018). Rebecca Solnit op.cit. p. 27. Four Woodbines in Leland Bardwell (2006) The noise of masonry settling Dublin, The Dedalus Press p. 57. James Hillman (1986) On Paranoia Dallas, Texas: Spring Publications, Inc p. 45.